Fr. McCann will be joining the Georgetown Law community this fall. More information will be available soon. 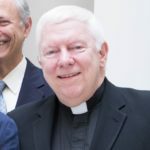 A Georgetown University Law Center graduate and a lawyer in a previous career, Michael has been the Jewish Chaplain for the Law and Medical Centers since August 2002. He has been a student of Judaism for his adult life and has taught numerous courses on Judaica, including courses at Georgetown Law and Medical Centers. 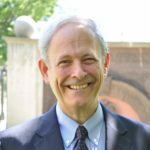 Michael endeavors to help students of whatever religion/spirituality (or not) find a home at Georgetown Law. Michael was instrumental in bringing Lawyers in Balance to Georgetown Law and believes that attention to mindfulness helps law students navigate law school and lawyers handle the pressures of practice. Rev. Harris is a graduate of Lincoln University of Pennsylvania where he earned a B.A. in Political Science and Religion. Rev. 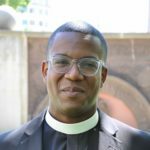 Harris studied theology focusing on religion and race and homiletics at Emory University’s Candler School of Theology from which he earned a Masters of Divinity with certificates in Baptist Studies and Black Church Studies. Rev. Harris is an ordained minister of the American Baptist Churches USA and the Progressive National Baptist Convention. Prior to serving at Georgetown Rev. Harris served in campus ministry at the Historic Ebenezer Baptist Church in Atlanta, Georgia. In addition to his role at the Law Center he is a Chaplain-In-Residence on Georgetown’s Main Campus. Rev. Alisa Lasater Wailoo is serving as the Interim Protestant Chaplain. Ordained in the United Methodist Church, Alisa has served as the Lead Pastor of the nearby Capitol Hill UMC since 2008, a wonderfully unique and welcoming congregation. She also serves as one of the on-call chaplains for the House of Representatives, offering the prayer to Congress when the US Chaplain is away. In addition, she’s a certified mentor for individuals in the ordination process and facilitates groups of provisional ordinands. Racial reconciliation and helping young adults find their callings are among her priorities in ministry. Above all, she’s passionate about welcoming ALL, helping tear down “human-made” barriers we construct with God and our neighbors, and housing justice. A former coordinator of the DukeDiv Women’s Center, a Lily Fellow at Duke Divinity school and proud graduate of University of Kansas (Go Jayhawks! ), Alisa loves being back on a university campus and welcomes you to drop by the Campus Ministry Office anytime. Imam Hendi is the Muslim chaplain at Georgetown University, the first American university to hire a full-time Muslim Chaplain. 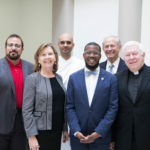 Imam Hendi is also the Imam of the Islamic Society of Fredrick and is the Muslim Chaplain at the National Naval Medical Center in Bethesda, MD. He servers as a member and the spokesperson of the Islamic Jurisprudence Council of North America. He is an adjunct faculty member at McDaniel College in Westminster, MD. 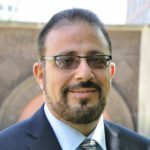 Imam Hendi holds a Master’s degree in Comparative Religions from Hartford Seminary in Connecticut and is currently working on his Ph.D. in Comparative Religion. In May 2002, Imam Hendi was selected by Hartford Seminary to receive its annual “James Gettemy Significant Ministry Award” for his dedication to his Ministry and for his work to promote peace-building between people of different religions. Imam Hendi has written numerous publications on many topics, including women in Islam, women and gender relations in Islam, the coming of the Messiah, and religion and Islam in the United States. He has presented a multitude of interfaith and general lectures in the United States, Asia, Europe, central Asia, Eastern Europe, and the Middle East in the last eight years. He was one of the Muslim leaders who met with the President of the United States in the aftermath of September 11 tragedy. Hoping to create positive relationships between the followers of the three Abrahamic religions, Imam Hendi often visits and lectures at churches and synagogues. He also serves on national and international interfaith councils. Imam Hendi offers Muslim retreats. He often leads Qiyamul-lail prayer and Jum’ah (Friday services). He also counsels students on academic, professional, and social issues. Imam Hendi believes that only with love and education can the world be a better place to live in. Mary J. Novak serves Georgetown Law Center and the School of Continuing Studies as a mission integrator, chaplain and spiritual director with a particular focus on Ignatian Spirituality and Pedagogy at the intersection of psychology, spirituality and the work of justice. Mary studied and trained in theology, spirituality and spiritual direction at Santa Clara University and the Washington Theological Union from which she earned a Masters of Arts in Pastoral Studies. She has extensive experience in pastoral ministry, including the ministry of spiritual direction, having served in hospitals and universities for over 15 years. A graduate of Santa Clara University Law School, Mary practiced for over a decade in the areas of California water, energy, environmental and natural resources law, first at Orrick, Herrington & Sutcliffe and then at Ellison & Schneider. While at Orrick, she served on a team pursuing a capital appeal for a man on the largest death row in the United States. 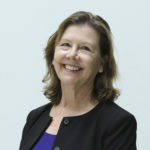 She was a member of the Clinical Law Faculty at Santa Clara University Law School and later, she served as the Director for Faculty Development in what is now the Ignatian Center for Jesuit Education at Santa Clara University. Another area of Mary’s study and practice is peacebuilding, having studied at Eastern Mennonite University’s Center for Justice and Peacebuilding. She focused her final project at the Washington Theological Union on Catholic Peacebuilding in the context of Kenya’s post-conflict reconciliation where she lived for a year. She returned to the U.S. to serve the Leadership Conference of Women Religious in their conflict with the Vatican. Mary currently serves as Chair of the Board of the Catholic Mobilizing Network to End the Use of the Death Penalty and Promote Restorative Justice.